SJ was part of musical camp of SPB right from his first movie as music director. With exception of few movies, she played a major role in his Musicals. Similarly, When SJ composed music for Mouna Poratam, She opted for SPB as only male playback in her music and he took care of back Ground scores as well. SPB won Nandi Award as Music Director for Mayuri where SJ had Lion share of songs and when this movie was remade in Hindi, Only one tune of SPB was retained in Hindi and SJ won Sur Singar Award for the same. 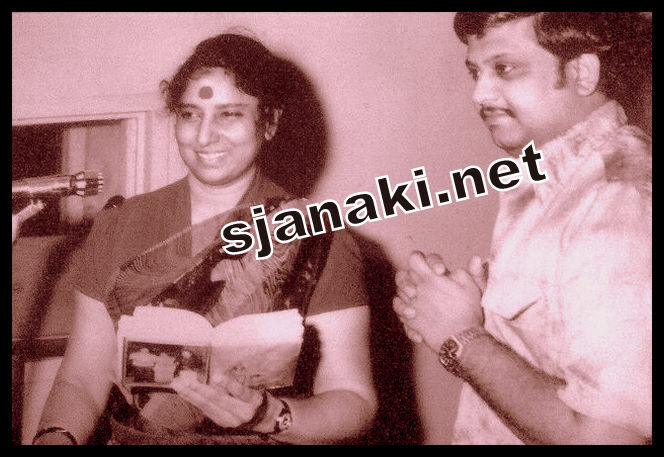 This is just an example for Musical collaboration between Balu-Janaki. It is very difficult to study musical Journey of either one of them without involving the other .. This compilation brings out variety of songs in their combination for various music directors from 70′s to 90′s. Ravivaramke andani song is equally (if not more) popular in Telugu as in Kannada (Ravi Varamana Kunchada). Similarly, Sundaramo Sumadhuramo had beautiful lyrics penned by Veturi (though for a dubbed movie). Nee Kannulalona is “Aagaya Gangai” in Tamil which had one of finest performances by SJ. There are few other songs from Erra Gulabilu, Tiger, Prema Sagaram etc .. which had their melodious counter parts in Tamil and Kannada. Another Interesting song in this compilation is Vidya Sagar’s “Okate Korika”. He re-used tune of his Tamil classic SPB-SJ duet Malare Mounama . When Karna was dubbed in Telugu, Telugu version (Palike Mounama) was sung by Mano-Janaki . Thus, Same tune is repeated in Telugu twice. He used same tune as “Olave Mounave” in Kannada and it was SPB-SJ again. Enjoy these Melodies & Stay Tuned for more songs with interesting trivia in upcoming compilations! !